Project Based Learning provides students with a wonderful experience to take part in a culture focused on rich activities and experiences. It promotes those important 21st century skills while balancing this acquisition with content knowledge. The activities are intentional and aligned with important standards. The standards and skills are constantly assessed in a variety of ways involving numerous stake holders. Most of all, there is an alignment between standards, skills, and assessment. By incorporating these indicators teachers are ensured that they have provided a project process that is built on standards and proper skill acquisition. Curricular Content – Students do have the need to learn base curriculums that will focus on those content standards educational agencies have determined are important. These are also those same skills that are many times tested on the standardized test, end of course assessment, and other high stake tests such as ACT, SAT, and AP. The PBL Unit of Study must focus on these along with deeper learning and 21st century skill acquisition. It is this combination that allows for quality and rigor while helping students see the connection of content to real world, college and career, and other disciplines. A PBL unit must embrace the curricular standards that a class is built on. 21st Century Skills – The 21st Century Skills come in different sizes, flavors, and colors. Typically they will represent the 4 C’s that include Critical Thinking, Communication, Collaboration, and Creativity. These four areas can be broken down into supporting indicators. Since collaboration is at the heart of PBL it should always be included, facilitated, and assessed. One or more of the other C’s should be intentionally included and assessed. Unpacking the standards can allow a teacher to take note of the verbs in a standard. Many times these verbs entail those important 21st century skills. Last, there are a few other C’s to mention such as Citizenship (including digital), Character, and Cyber (Technology). Formative and Summative Assessment–Obtaining progress data is imperative and typical summative assessment can be employed. After-all this will help students prepare for many of those high stake tests that continue to prevail. Also, keep in mind that a summative form of assessment can go far beyond a written test. Also, consider ideas of performance, product, and demonstration of knowledge. Just as important, if not more so, is formative assessment. While this might be graded, the emphasis should be on the learning and improving. These formative pieces could be activities, discussions, check offs, conferences, organic discussions, conversations, benchmarks, games, practice, and group metacognition. Equally important is a formative assessment that allows for critique from teacher. All of this should focus on review and reflection by peers and the individual. Through these processes students will become aware of “how to learn” and will discover and practice the flow, cycle, and iterations that are the essence of learning. Intentional , Aligned, Varied, and Constant Assessment – In PBL the content standards, skills, and assessment are intentionally planned to assure that the project and process provide a high quality and rigorous learning experience. The project components and scaffolding are aligned to the standards. This ensures that the entire project including entry, questions, student inquiry, lessons, activities, rubric, assessment, and products are in sync. This intentional planning and alignment allows curricular content and 21st century skills to be activated, assessed, and in balance. Most of all assessment must be constant. While the idea of formative implies this, I think it is important to keep in mind that this also means ongoing and constant. Keep in mind that assessment must be varied to meet all students needs. Most of all, final assessment must lead to the student as owner of the assessment. There are a variety of individuls that can provide feedback along the way including teacher, mentor, parent, and peer… but self assessment might be the most important. The acquisition of content knowledge that has been deemed important by society is one of the key functions of education. Project Based Learning honors this by immersing students in important content providing that needed foundation. In a world that is seeing content multiply at an expositional rate, it is also important to help students become seekers of knowledge and lifetime self-learners. Along with those additional 21t century skills, PBL provides the avenue to both build the content foundation while activating the natural ability to learn that is inherent in all humans. OER Commons – A great place for open and free content aligned to the standards. The Padagogy Wheel – A wonderful wheel full of great verbs for doing, aligned activities, and amazing tech apps. Best of all it aligns with SAMR and Blooms. P21 – Become familiar with the amazing site that focuses on the 4C’s. You will find research, rubrics, and some wonderful ideas. Webb’s Depth of Kowledge – Take a read through this ASCD artcle entitled, “What EXACTLY Is Depth of Knowledge? (Hint: It’s NOT a Wheel!)”. It really is a great read and emphasizes the need to take standards to their highest level of learning. Standards, Content, Alignment in PBL Series – Be sure to check out my four part series that wil help you with grounding and aligning content standards in PBL. Read the first post… and the keep reading those that follow. BIE Rubrics – Check out these 21st century skill rubric listed at the BUCK Institute. Make it part of your formative assessment. Resources for Assessment in PBL – Looking for tools and strategies for effective assessment in project-based learning? To support you, Edutopia has assembled this guide to helpful resources. Performance Task PD – Ready to go beyond traditional assessment? Check out this seven part blog series on performance tasks by Jay McTighe. Follett Challenge – Take a look at these videos of contest entry videos providing a wonderful look at projects that provide connections in multiple ways. 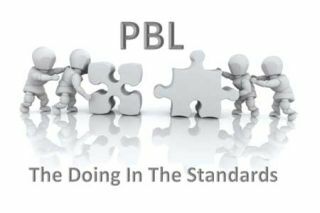 Gold Standard PBL: Align to Standards – John Larmer at BIE begins by asking the question, why aligning a project to standards deserves to be called out on the list of best PBL practices. Did you enjoy this series? Take some time take another look at all of the seven block that so important to student learning. I have listings to all of the posts below. Also, consider contacting me at (mjgormans@gmail.com) for your next professional development. I look forward to being a part of your school’s or organization’s inservice!